Induction drum Heaters WA-Type A are used for steel drum heating. There hose-down rating, makes it particularly suitable for harsh environments, there are no moving parts, making it the most reliable drum heater available. Induction heaters for drum heating have been in service for over 25 years! 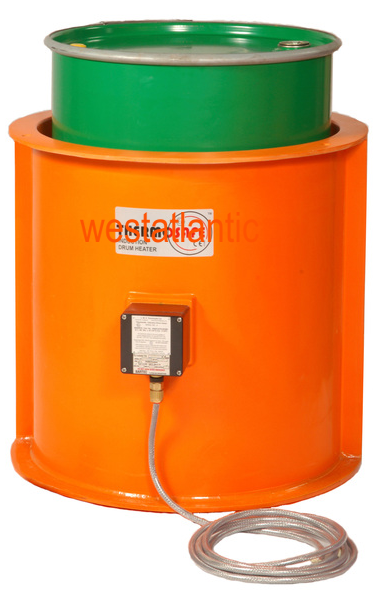 Induction drum heaters WA-Type B are used for applications where the voltage supply is 120v. When difficult solids need to be melted and removed from steel drums , base heaters can be added to the system to further speed the melt time. Where it is desirable for liquids to be heated as fast as possible for any process, induction systems are a valuable time saver. induction Barrel heaters, 120/240 volt available. USA: Texas, TX, Houston, New York, NY, Illinois, IL, North Dakota, ND, Iowa, IA, Ohio, OH, Michigan, New York, NY, Utah, Arkansas, Kentucky, KC, California, CA, Colorado, Denver, Louisiana, LA, Florida, FL., Pennsylvania, PA. Wisconsin, WI. Canada, Ontario, Oakville, Toronto, London, Hamilton, Mississauga. Alberta, AB; Edmonton, Fort McMurray Calgary. British Colombia, BC; Kelowna, Vancouver, Prince Rupert, Kitimat. Saskatchewan, SK; Regina, Saskatoon, Prince Albert, Esrevan, Swift Current. Manitoba MB; Winnipeg, Thompson. Quebec, QC; Montreal, Quebec City, Trois-Rieviers, Chebougamau, Sherbrooke. QC, Alberta, Saskatchewan, Manitoba, Quebec, New Brunswick, NS, newfoundland.